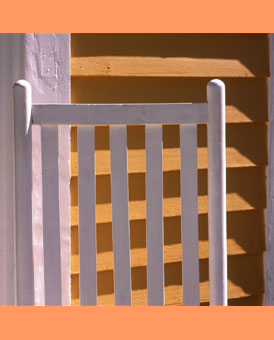 A ladderback chair makes a potholder grid of color against the clapboards of a Camden, ME antiques shop. Chocolate brown in the shaded areas and almost a warm peach color where the afternoon sun was hitting straight on. I cropped the photo several ways, tried different lens, got closer and closer till you could barely tell a ladderback was the hero of the scene. I’ve a long history with ladderbacks and understand them well. In the kitchen back in Gorham where I grew up, you NEVER hung even a flannel shirt, and certainly not a winter coat or a backpack on a ladderback, for you no sooner turned your back than the ladderback hit the ground with a loud thud. Everyone would forget, and you rarely got through a meal without your Mom or Dad yelling a reminder for the umpteenth time.